Have you ever seen a plane flying overhead and wondered just how high up it was, where it was going, or what flight number it identifies as? Now you don’t need to wonder anymore, because your iPhone (or iPad) can tell you exactly what flights are flying above you by way of the ever-useful iOS assistant Siri. Siri can get the aircraft flight number, altitude, angle, aircraft type (the actual plane model like a Boeing 767-300, Airbus, or a Learjet 60, Cessna, etc), slant distance in mileage, and even a nice sky map showing where the sun or moon is in relation to the flights, helping to place them out in the sky. 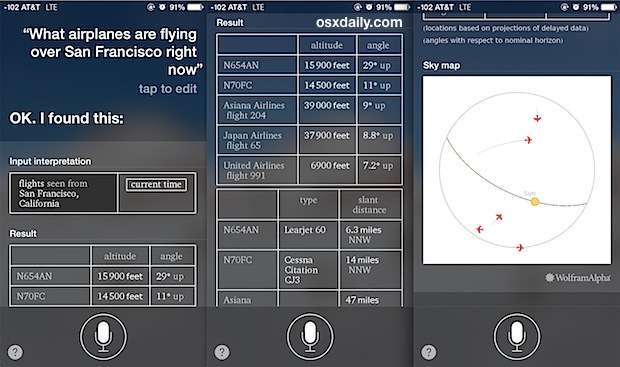 All of this comes courtesy of Siri’s connection to WolframAlpha, but the data itself is provided by something called ADS-B, an FAA tracking technology aimed at increasing flight safety and efficiency. And now you have access to that data in the palm of your hand thanks to Siri and the iPhone, how cool is that? What airplanes are flying above me? What airplanes are flying over San Francisco right now? What airplanes are flying over the Grand Canyon? What airplanes are flying over [location]? Which planes are overhead right now? Use this to quell your own curiosity, satisfy your inner flying nerd, discover which plane is leaving those long vapor trails behind them, debunk some chemtrail or UFO speculation, or maybe help to answer which of the planes flying above you is the one with inflight wi-fi that your buddy is iMessaging you from. This seems to only work with traditional planes and aircraft, and when testing it out with nearby airborne helicopters they did not seem to show up for whatever reason. Whether or not this works outside of the USA remains is not entirely clear, but because the data arrives from the FAA it very well could be US-only, or at least a regional thing depending on your country. By the way, this works on all iPhone models as long as Siri is enabled and location services are enabled, and the device has an internet connection. Sometimes you have to adjust the language a bit, but Siri will use your location to ping WoframAlpha for flight data near you and offer the details accordingly. It absolutely works, so if you are having troubles getting the flights to show up, try adjusting your language a bit, asking Siri to ‘show me flights overhead’ for example. Mac users without Siri don’t need to feel totally left out, if you get flight information sent to you through email you can use Mail app to track flights with the accompanying Dashboard widget. Not quite the same, but still convenient and interesting. Whether you’re a fan of flight or just curious what planes are in the skies above you, now you can know in an instant. This is fun little find from Wolfram Alpha and CultOfMac. 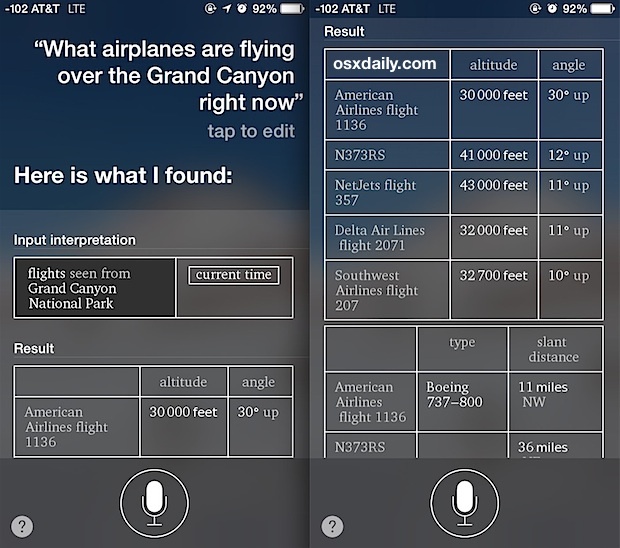 Looking for some more interesting or useful Siri tricks? Don’t miss our Siri archives, we’ve got plenty of things you can do with the smart assistant. Definitely works in Eastern Ontario Canada. Super cool. My kids love it. Doesn’t seems to work for the MH370 Boeing 777. Did not work in the Netherlands. Basically only got web search results back. Even choosing WolframAlpha from one of the options, did not give results line the ones shown above. Doesn’t work in the UK. Siri just returns the results from it’s Bing web search. You can still ask about flights over US airspace. Another US only tip. Could you give us something that we can all use please? Doesn’t work in Stillwater, OK – all I get is a website search. Does this work in Malaysia? Didn’t work in Manchester, UK. doesnt work here in BC Canada. took me to a web search…. I’ve tried every phrase possible, and siri just tries to web search what I said every time. I tried the same phrases on my mom’s 5S(I have a 5) and it worked for her but not me. Any ideas? My iOS is updated to the latest version. It wasn’t working for me turned on location service for siri and it works, iphone 5 in kelowna BC canada. Pretty awesome was feeling left out lol. Now that the funs over on to the next find. I’m here in Tokyo, Japan. I turned on my location services for Siri (they were actually already on anyway, so I just double checked them). I’m still only getting web searches. I guess it doesn’t work for Japan, then? Anyone from Brazil had success? Doesn’t work in North Florida. You have to turn on the Location for Siri specifically after turning on the general phone Location. It is not working on this phone, however it did on all previous iPhones i owned, 4s, 5 and 5s. Not workin in Boston. Only get web search!! If it did, I would be using this all the time….it’s a really cool feature! Not working in San Jose, CA with iOS 8 location services on. Disappointing. Siri works all the time to identify overhead airplanes in regions that are supported, which is basically all of the USA and Canada, whoever has the FAA tracking flights. What’s critical is that you must use the proper command with Siri, and Siri must have location service access, saying the wrong command will cause Siri to search the web instead, as will not having location services enabled. For that reason, it works best on the iPhone, though you could probably do it with the iPad too. Ok so it appears Siri properly interprets the phrase “show me what planes are over my head right now.” Omitting “show me” produces a web search instead. However I can’t seem to modify the working phrase to include other places, like the Grand Canyon or Boston. Is not working on my 6+ iOS eight. All I keep getting is web search queries. And then she told me “I cannot do this for you” and then the other response I got was “I am not allowed to do this for you, my apologies.” So maybe they blocked Siri from doing this for security reasons? All I know is whenever I ask Siri any questions I get all kinds of screwed up responses. I think my Siri is malfunctioning or she’s been smoking crack. Doesn’t work in the mid Atlantic states near Dulles. Used to work now only produces web results. Some regions don’t support the feature, you can contact your local FAA office to inquire about that. Be sure you are speaking correctly following the instructions too, if you ask the wrong question it won’t work. I’m assuming (they) yanked that functionality for security reasons. The data is still available if you know where to look but they’ve made it a lot harder for anyone to just whip out an iphone & figure out what planes are flying above any given moment. I tried this, siri’s location is on, and I get directed to this site. I can not get information on overhead flights. This is in NJ, USA. It’s not working in Iran . Doesn’t work in South Africa. All I get is a web search😔😢. Would’ve been great thou. Does not work in WV or Ohio. Location Services for Siri is on. Using iPhone 5S and IOS 8. Works in Yorba Linda CA. Not working in Malaysia. Even with Location setting turned on. What happens if you get a web search instead? Then you get a web search and you can look up the planes overhead flying through the WolframAlpha website. Siri should give you the data on the iPhone, but if you get the web search, use WolframAlpha directly, it works as well. I am working in western Canada but live in Nova Scotia, and it has worked for me even when asking about other locations such as Toronto. All you have to do is say “Ask Wolfram what flights are (overhead, above Toronto, above New York, above San Diego, above Chicago)” . These all worked for me just now. Nothing for the UK though. cell data being on also effects whether or not it works. Works fine in the USA, just did it right now. Maybe where you are located in the United States has no planes flying overhead at the moment? I’m in America it works fine for me on the east coast. It works good in Scappoose Oregon. I think it’s cool to see comments from people all over the World. I love you. You have to turn off the bing search results located in settings under siri for it to work. It’s not working in afghanistan.how does it work actually.plz anybody can reapply me? Shukla, it works fine in most parts of the world. Siri works everywhere too. But, for finding planes, I’m going to take a wild guess and say that if this is not working in Afghanistan it’s because some of your fellow countrymen are not exactly friendly or peaceful individuals. Maybe if the humanitarian and political situation calms down it would be possible. As someone above said, you have to specifically say “SHOW ME WHAT PLANES ARE FLYING OVER ME RIGHT NOW” otherwise you get web searches! The “show me” part is the key! This did not work here in ATL, the home of the world’s busiest airport; if it doesn’t work here then I don’t see why it would work anywhere. I’ve tried every phrase mentioned in this thread and all I get are web search results. This works fine to locate planes flying above you, I just used it right now and was able to identify a plane overhead. You need to have location services turned on, otherwise it will search the web for results instead of looking for planes in the nearby sky. It’s through Wolfram Alpha, the feature is always there. It works here in Hammond Louisiana 40 mile from New Orleans. U.S.
Doesn’t work in the UK! Another example of UK inferiority. Like so much else, this fails to work in “Great” Britain but from what I read here works just fine in Great America. When will the UK ever catch up or do anything remarkable technology-wise? I use Siri to see planes fly overhead when I am curious. This feature works everywhere in the USA to see planes flying overhead. You are doing it wrong. John benerba, you are another conspiracy theorist retard! Works here in MO. We live right under a well travelled flight path, but have a few planes that seem “stuck” midair? Lol. They’re ALWAYS there above our house, incognito I guess. They NEVER actually fly, regardless of what time of day, they show up as being just above our house. One is always 10,000’ and the other is 800’ ???? They must be good at hovering and cloaking. Hahaha! I’d like to know what makes a major airline show up as “stuck” in midair? “Debunk” Chemtrails! 😆 Do aviation personnel really think civilians think these are “vapor trails?“Anyone from Southwest, Alaska airlines or anyone else who is spraying our skies better watch out for themselves and their families. We’re coming after you. Debbie, this is an article about using Siri and the iPhone to see what planes are flying overhead, it is accessing airline and flight data to accomplish this. This is not a conspiracy discussion. Your comment is so bizarre it must be a joke. But here is some unsolicited advice; don’t threaten anyone, let alone post your threats onto public forums on the internet. I’m 90 miles south of O’Hare. There are 5 planes stacked on top of me and others various distances away!